With the support of Smart Cash community, we will produce a webserie called Decentralized Future, with more than 30 hours long content talking about the disruptive technologies of the cryptosphere that will change the world, with the most relevant people and companies available on the brazilian market. This will be a game changer for the entire cryptosphere. For years all brazilian media use a bad narrative about cryptocurrency. To fight back, we will interview the best brazilian companies and specialist of the cryptosphere (including the renomaded RSK from Argentina) and show to millions of brazilians that there are very serious companies and people behind it, working for a better future. The web serie will also bring in a more mature audience of professionals working on the main sectors of the economy. There is no high quality content talking about cryptos in Brazil, neither talking about SmartCash project, this is a important step to achieve mass adoption, and we need your support to make it possible. To produce the first Brazilian web series about the cryptosphere with cinematographic quality. 400.000 non-investors of all economic sectors. These webserie allow SmartCash to get exposure and reputation to thousands of serious brazilian people and companies. Each main episode will be around 1 hour in length. It will start with the SmartCash logo as the Sponsor. Plus the full interviews, about 30 hours. It will finish with the SmartCash logo as the Sponsor. 300 Traders is a new Brazilian company, specialized in courses and training for traders and Brazilian investors, focused on the crypto-currency market. The teachings within our courses combine the principles of trading and traditional economics to the use of cutting-edge technologies and strategies in the crypto-currency market. Leandro Lima, Co-Founder of the 300 Traders. Former Ex-Investor of fixed income assets of Brazil during the years of 2012 to 2015. In cryptocurrencies since beginning 2014 - full time since ending 2016. Our main goal is to empower mass adoption.I am new on Smart Cash community, since I’ve discovered, I decide to become a holder and active promote it. Edson Beux, Co-Founder of the 300 Traders. Formerly Ex-autonomous variable income asset trader at BMF-Bovespa, from 2013 to 2017. Worked as a futures trader at Propex in the city of Sydney, Australia, from 2016 to 2017, trading the US and Australia treasures. Also a teacher of the 300 Traders. 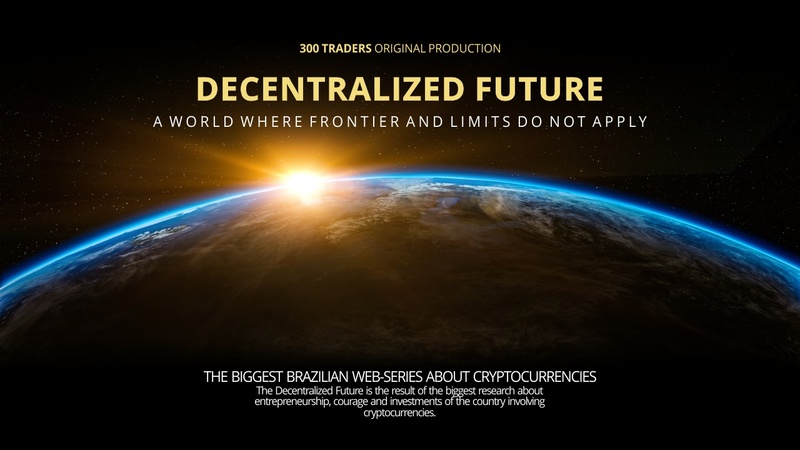 300 Traders will produce a webserie called Decentralized Future, the largest brazilian cinema-produced crypto-coin series with people that we consider references in their respective areas of expertise. Business Consultant with a focus on developing new network based business models, helping companies move from industrial age models for the knowledge society by applying concepts such as social networks, cloud computing, collaborative work and networking. With 25 years experience in sales and marketing on several models and business, from consumer goods manufacturing to services. 8 years working with networks and business models on the internet. Embarcados is a website that has more than 150.000 thousand accesses p/month talking about Internet of Things, hardware and software, in addition to doing more than 50 lectures per year all over Brazil. He speaks openly that he invests in crypto-coins and believes in it’s potential for the future. 20 years of experience in the area of variable income with passages by areas of trading, analysis and investor relations. Specialized in the area of Dynamic Hedging. Extensive international experience for 10 years in the USA, where he had obtained his academic training and worked for Bozano Bank, Simonsen in NY. Transfero Swiss AG is specialized in cryptocurrencies and digital assets investment products, including the safekeeping of digital tokens. Based in Switzerland at the heart of the crypto-valley, it customers can expect a frictionless experience when investing in cryptocurrencies, not having to worry about mobile wallets, private key backups and other technical complications that are inherent to the digital assets market. Member of the advisory board of Equilibrium Entreprises in the field of Innovation. A* Star Business Developer. Co-creator and presenter of the Bitcoin webseries in Portuguese. He was the project director at FGV Júnior Consultoria & Finanças, where he led consultants responsible for entrepreneurship and strategic planning of the company. Researcher at ITS Rio, acting since 2013 on the fronts of Bitcoin, blockchain technology, digital security and online education. Sponsored posts on websites of relevance. 5th May - The post production it will take 1 month - it involves legal processes, authorizations of images, audiovisual editing, etc… it’s the most complex process and takes time. 10th June - Start the pre-launch of the webseries, working on teasers and organic networking to prepare the people for whats coming. 10th July - Release of the Decentralized Future webserie. As you can see most of money will be spent on airplane travel, filming, edition making and marketing. There is no high quality content talking about cryptos in Brazil, neither talking about SmartCash project, this is a important step to achieve mass adoption, and we need your support to make it possible. A great initiative. in Brazil there are many people interested in cryptmoedas, but they have a primitive and inferior knowledge about the market. A possibility of web series will add much to the knowledge of the people in the search of the development of a decentralized world! Leandro, the proposal seems cool, but I think we need a bit more for SmartCash than just our logos on the beginning and the end, would it be possible to have dedicated episodes to talk about SmartCash? Yes. We are talking to the Smartcash community to have a dedicated interview to talk about Smartcash.